HIAWASSEE, Ga. – Upon final approval from the Towns County Board of Education, high school biology students will have an opportunity to visit the newest chimpanzee sanctuary in the United States this March. 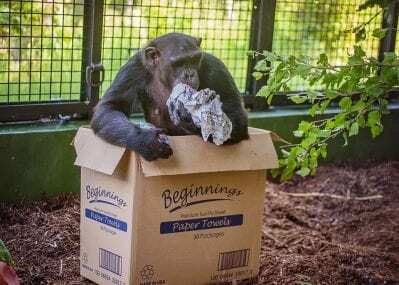 Project Chimps is a chimpanzee sanctuary, founded to provide lifetime care to more than 200 former research chimpanzees at its sanctuary, located nearby on 236-acres of forested land in Morganton, Georgia. A total of 59 chimps currently reside at the habitat. 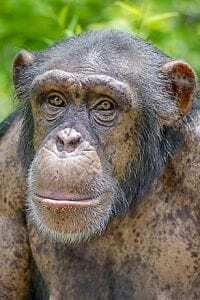 Noel, a peacemaking, middle-ranking chimp in a group of nine. The chimpanzee sanctuary is a non-profit organization, funded by donations, grant funds, and corporate sponsorships. Additional information is available at Project Chimps. Feature Photo: Emma, a 13-year-old chimpanzee, residing at the Project Chimps sanctuary.